As a pet owner, their hairs consume me. Not literally, although sometimes if I miss a day's vacuuming it does feel like we're being overtaken by pet hairs as the cream carpets seem to disappear beneath them. No, I mean consume me in the way that I am always trying to find something to make them easier to handle. After all, shedding is to be expected if you own a dog or cat, it's just how it goes. But at home, I have three black and tan dogs and a cat, who admittedly saves her hairs for your clothes or her hammock bed,but it's something that's always in mind because it's ever present. Even still, my policy is that just because it has to be done, doesn't mean it has to be a job which overtakes your day because working full-time I simply don't have the time to allow it to. No, for me the best way to handle it is to give myself a time limit for it each day and know once that hour's up, it'll all be done and it's just an hour. 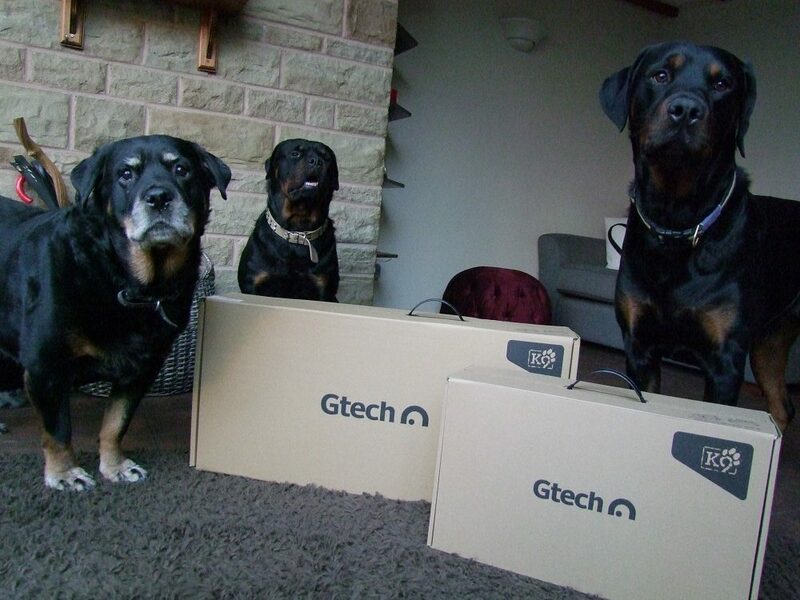 Recently we were given the chance to review the newest additions the Gtech range suitable for pet owners - the Gtech AirRam 2 and the Gtech Multi K9. You can read the upright Gtech AirRam 2's review here but read on below to find out what I made of the Gtech Multi K9 handheld cleaner (RRP £169). As much as I have been a fan of the Gtech upright cordless cleaners, I have to admit the original Multi left me a little underwhelmed if I'm honest. I just couldn't quite get to grips with how best to use to navigate the accordion style hose which was attached to the handheld cleaner. And so when given the chance to review this model I was, I'll admit, more excited to review the upright vacuum cleaner. I knew unless they'd done something drastically different with the Multi K9, I'd use it sporadically but not regularly. Recently I reviewed a cordless cleaner which changes from a vacuum cleaner with a long attachment to a handheld device, it had more minuses than plus points for me and without really realising it because I'd used more as a handheld, when I came to reviewing the new Multi K9 I automatically compared. What's the Gtech Multi K9 all about? After being thoroughly inspected and cleared to be opened, I started to find out. As you'd expect from Gtech, the design of the Multi K9 is in keeping with the greys and greens we've come to recognise from the brand, cordless there's an emphasis on battery life and easy use across the range. What I found most useful about the cleaner is the similarities between it and the upright cleaner, so you sort of have a handle on things, if you pardon the pun. For example, the fresh scent filters with the green paw print embossed at the end is the same for both models - so you don't need to keep separately (one less job to think about!). The plug to charge is the same for both models so if you have both models and keep the upright cleaner on charge constantly (like me), you just need the one plug to move from unit to unit to charge. Even the green sponge-like filters are made from the same material, although are different sizes. The Multi's battery charge time is similar to the standard cleaner, 4 hours to fully charge, and gives around 20 minutes of continuous use. Gtech say that if you charge for another hour you'll get an added short burst. The new Multi K9 also brings with it various attachments as standard, including a 36cm extension tube for corners or hard to reach cobwebs, as well as a crevice tool for corners and a dusting brush. This unit still comes with the same flexible hose, which I admit I am still getting to grips with using on its own - but it does have its uses, such as getting into the corners of an oval dog bed. To add the dusting brush tool to the end of the hose tool shown below, simply slide on and then you can pull the attachment out to show the green accordion style flexible hose. All tools are added or removed easily. Simply push, as below, away from the main body of the handheld cleaner and you can add or remove as needed. What I specifically like about this cleaner and use almost exclusively for on a day to day basis is the Power Brush Head tool, which is ideal for sofas, stairs and I can see it being useful for vehicles also (please don't tell my husband, he'll only ask me to do it while he watches to 'learn' before forgetting next time and needing to 'see how it works again'. We all know what's going on). Our stairs are a nightmare for cleaning with normal vacuums. I've tried to clean in the past with the upright as I go but really I know there are still hairs hidden in the crevices. I try not to wear my glasses when I do it. I can't see them = they don't exist. We also recently bought a fabric sofa and although I said it definitely wouldn't be a big dog bed. Ultimately, who's telling the three bears not to go on it when we're not there. Or even if we are, who's to say they'll move (Mia). So the attachment which allows me to make light work of these jobs is much appreciated and they attach or are removed easily. The light which highlights the area in front while vacuuming is also a handy little feature, although it's not something I thought much about before using, for stair areas in particular - glasses or not - it tells me what hairs are there, which is good. I suppose. No, really it is - who knew so many hairs could be shed just by walking, running or thrashing up and down the stairs (Danny and Chris) at the sound of a dog barking nearby. Once finished, it's easy to empty with little to no mess. Simply pull the see-thru bin out (and you do need to pull it) using the handle as you can see below, hold over your bin to empty into and open the grey flap at the bottom. You can then empty any excess hairs stuck without much trouble and take out the sponge-like green filter if needed to tap clean or replace your floral scented tab, which you can see at the top using the paw print to identify. What are the benefits of the Gtech Multi K9? For me, the biggest benefits are the suction and the power button. The suction is as you'd expect for Gtech. It's powerful and with that, once you've used it you don't generally have to keep going over the same spot. With the power button, you press it and leave it. It's like a little lit up miracle when I compare to the other handheld I reviewed recently. It may sound simple but it's something I took for granted being able to do. With the other brand's handheld model you had to hold the button down and permanently hold it while operating. It took some getting used to but I didn't realise quite how much it was a bit of a hassle until I realised I didn't have to with the Gtech handheld. All in all, I actually do like the Multi K9. I have two handheld cleaners in my home and it's the Gtech I turn to because it's just easier to use. It has the suction power I need to tackle pet hairs, even ones which have got stuck in between the carpet fibres and it has all of the attachments I might need. Cost wise, it's also reasonably priced in the sector in my opinion and comes with a box of extra scent boosters and an additional filter. At £149 it's a decent price for a decent handheld and is the same price as the previous model. If you combine both the Gtech AirRam 2 and Multi K9, there is a special offer on the Gtech site (link below) which is still very competitive - or much less (by more than £100) - than others in the market.